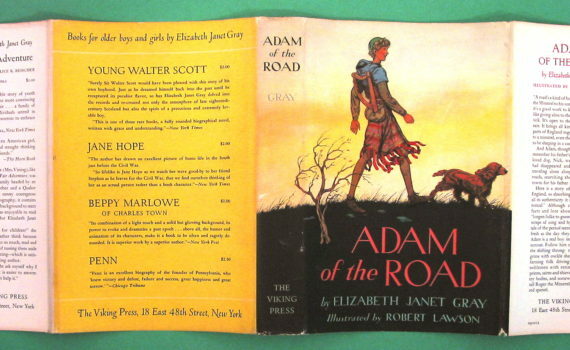 For anyone who has ever had an interest in medieval times and culture, especially in England, Adam of the Road is the perfect traveler’s guide as you explore the countryside in your mind and meet the people of the era through Elizabeth Janet Gray’s wonderful words. It’s like stepping back in time and learning about everything you can touch and taste from a fellow adventurer who happens to have studied it all. Because, not only does Gray write the tale so pleasantly, but she treats ever chapter as a learning experience for the reader. I read this book to my children, which was my first time as well, and a more lovely tapestry has seldom been woven, a perfect mix between fiction and fact. Adam is a minstrel’s son, which means the road is his home, and he wouldn’t have it any other way. His father, Roger, travels the world with royalty providing them with music, stories, tricks, and entertainment, brightening up their lives when the halls are dark with winter. He is rewarded quiet handsomely, recently with a horse called Bayard, and Adam is proud to be his son. Adam has an animal all his own, a spaniel called Nick, who he loves with all his heart. The foursome, two men and two beasts, travel and perform together, until a bet gone wrong changes things much for a worse. A villain named Jankin, as sore a winner as he would have been a loser, takes Nick from Adam during the night in an inn on the road, running away like the thief he is. So Adam and Roger set out to claim what it rightly theirs and to save a friend, beginning a journey both exciting and dangerous. What a lovely story, and what an entertaining way to learn a thing or two. I’ve always been fascinated by the Middle Ages; as a kid I had a Medieval Encyclopedia and would pore through it, reading every fact about every king and trying to imagine it all. With Adam of the Road, you don’t have to imagine anything, Gray plunks you down in the middle of the life of a boy who you wish could be your friend and you travel with him, as he tries to set right what has gone so awfully wrong. Adam is an exceptional character, one that I’ll remember forever, and I’m glad my kids got to meet him too. Also, apart from the inherent beauty of the tale and its history, Gray writes in an awful lot of subtle humor, some of which only comes out if you read the book aloud, so gather up the family and tackle this wonderful tale together; you won’t be disappointed.